In Federalist #24 Alexander Hamilton discusses the need for a Standing Army in the United States. Furthermore, Hamilton argues that the Constitution is actually a better guard against the abuses of Standing Armies than that of the State Governments. By the time he published Federalist #24, Alexander Hamilton surely would have heard that New Jersey became the third State to ratify the Constitution the day before. That being said, New York was still his target readership as it may well have been the most difficult State to convince of the necessity of establishing a new Government. In this Paper, Hamilton dismisses arguments against a standing army. It is often said that one of the complaints colonists had against Great Britain was the keeping of a standing army in peacetime. Although many Founders did file this complaint, it was actually the quarter (AKA housing) of soldiers in everyday people’s homes that made the public upset. However, many Anti-Federalists were shouting about how this Constitution did not outlaw a standing army and would lead to tyranny. Hamilton counters this by saying that, instead of something to be feared, a standing army was necessary for the United States. Hamilton’s argument for a standing army begins with foreign powers. Both Britain and Spain shared large borders with the United States and could easily invade if the Americans were not prepared. Additionally, the Native Americans lived right on the edge of the nation and were often aggressively hostile. In this circumstance, Hamilton argues, it was (and had been) necessary to keep soldiers stationed at frontier forts. Without a standing army, these forts would have to be run by local Militias. On top of being costly and disorganized, Alexander points out that it would be difficult for everyday people to leave their jobs for extended periods to sit in a fort on the frontier. In Federalist #24, Hamilton proves that the Constitution is actually a better security from the dangers of a standing army than the individual State Governments. This is because the Constitution specifically puts control of the army in the hands of the Legislature. As opposed to most other nations (and some of the States) who put armies in control of the Executive Branch, the popularly elected Congress would be able to restrain an army from growing dangerously large. Additionally, the Constitution only permitted Congress to call together the army for a period of two years. In comparison, most of the State Governments had no regulation over standing armies, and the two that did only made a recommendation that they not be kept. No State had actually banned standing armies outright. Have you missed any of our previous Federalist Friday reviews? You can see the list and get caught up here. Want to read the Federalist Papers but hate the old-timey language? 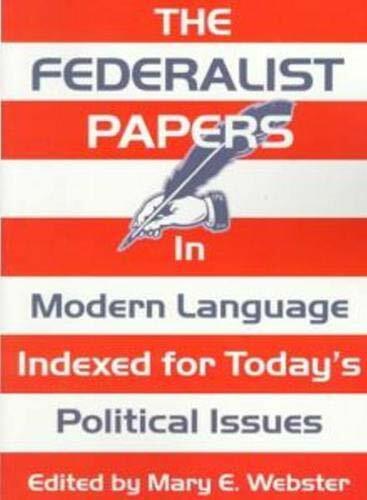 Try ‘The Federalist Papers in Modern Language.’ The title pretty much explains what you can expect.